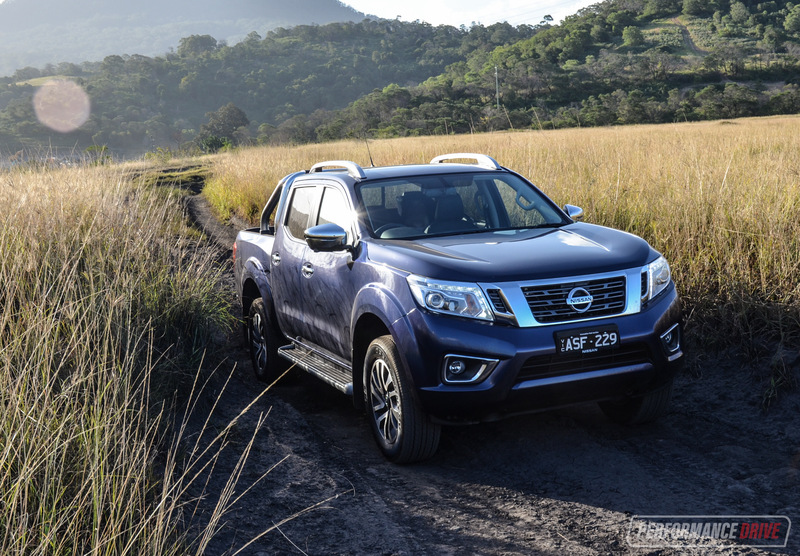 The 2018 Nissan Navara Series III comes with some impressive updates that are aimed to make the Thailand-built ute a more enjoyable drive. Some models now come with added safety tech, including a 360-degree camera (ST-X model, as tested), as well as a quicker steering ratio to help with maneuverability in traffic. The entry price for a 4×4 dual-cab pickup Navara starts at $42,990 for the seven-speed automatic RX, which is up $500 compared with the 2017 Series II model. The SL 4×4 remains untouched at $43,990, while the ST is up $200 to $47,190. 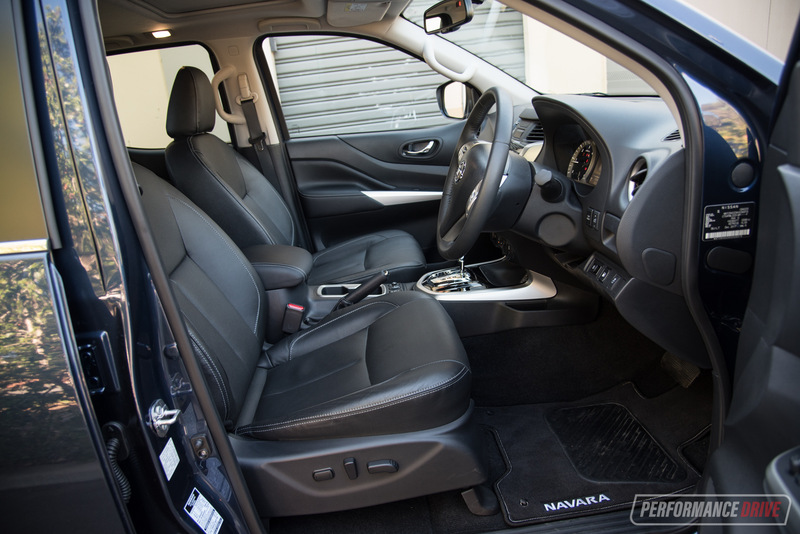 The top of the range ST-X 4×4 model we’re testing here is priced from $52,490, with extras such as heated leather seats ($1500) and sunroof ($1000) the only available options. 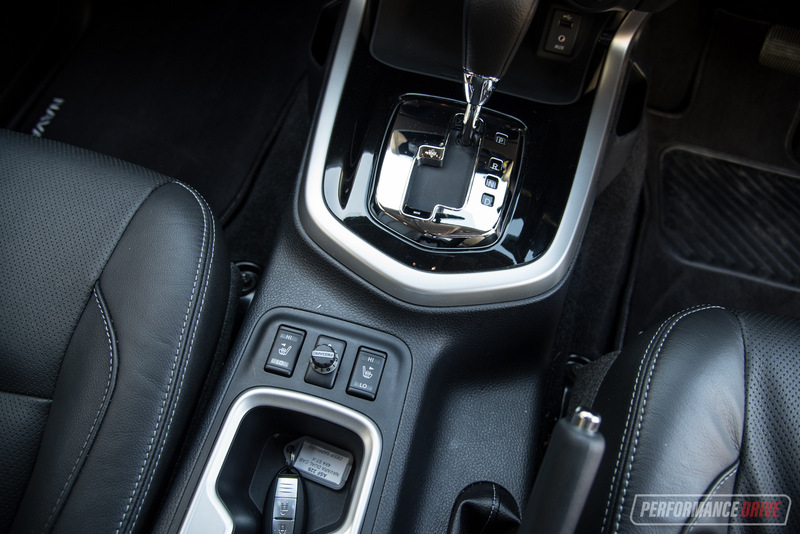 Six-speed manual comes standard on SL 4×4, ST 4×4, and ST-X 4×4, with the seven-speed automatic transmission a $2500 option. Power continues to come from a 2.3-litre twin-turbo diesel four-cylinder for the ST-X, producing 140kW and 450Nm. Fuel consumption for the combined trip is rated at 7L/100km when equipped with the seven-speed auto. 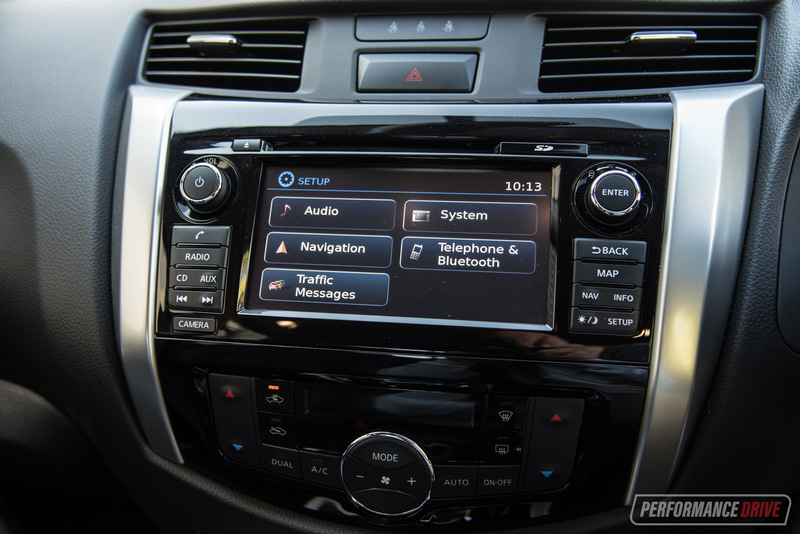 Step inside the ST-X and you’re treated with quite a good setup. Though this is a commercial vehicle, it doesn’t feel or look it. The trim is nice for a cabin that’s going to see its fair share of tradie wear and tear. 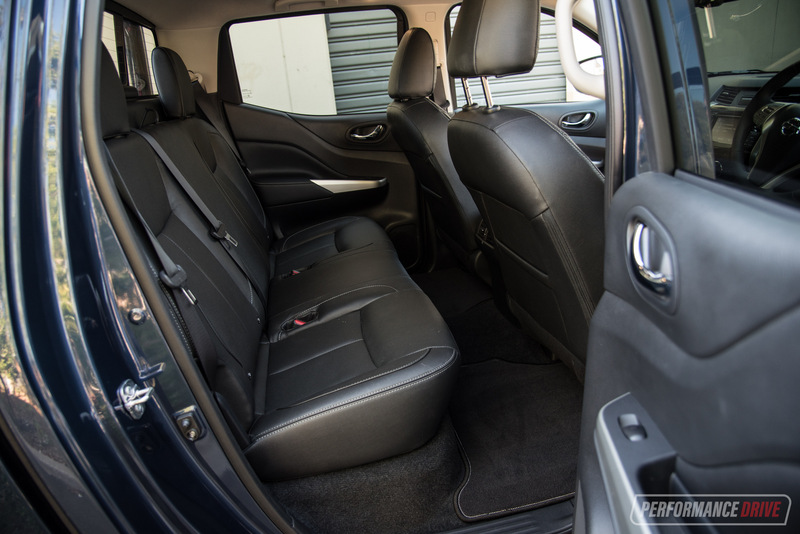 There’s enough soft and easy-on-the-eye materials to make it cosy, but it’s also equipped with some hard-wearing plastics that will be able to deal with messy occupants. 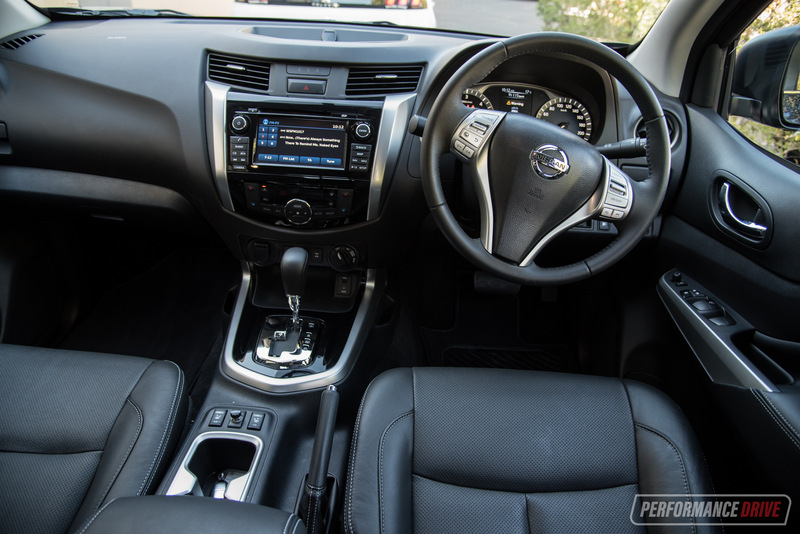 There’s something to be said about the ergonomics and the comfort of the cabin. It’s definitely a nice, comfortable place to be, however the driver’s seat feels a bit too close to the B-pillar. 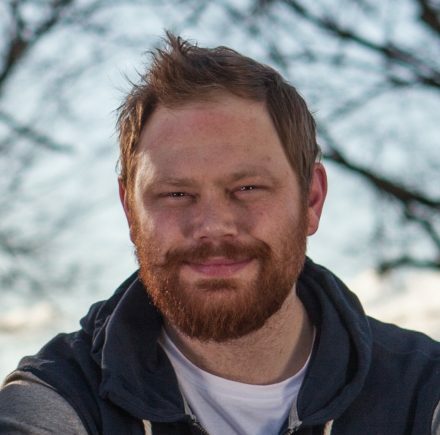 Also, if you’re taller than 190cm (or thereabouts) your head will touch the optional sunroof lining – it can be quite annoying. Best way to avoid that (if you’re tall) would be to leave the sunroof option unticked. At the back the neat little sliding window is a nice trick to keep the kids entertained. 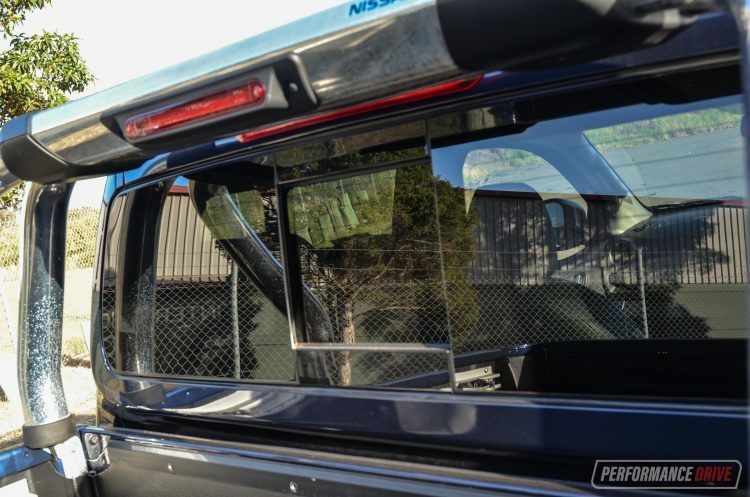 It also helps to freshen up the cabin when you have any of the side windows open by sending air through the cabin and out the back. The ST-X model tested here features an ‘utili-track’ system that includes two channels and four heavy-duty forged aluminium cleats that can slide side to side for convenience. Once locked into position the cleats offer up a number of tie-down options for various types of loads. 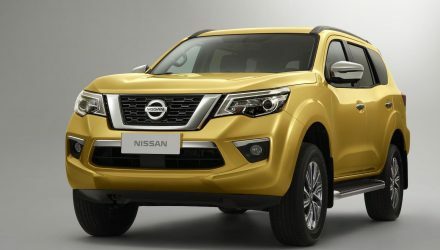 In further changes, the 2018 Nissan Navara also features an assortment of new safety and technology updates including a 360-degree ‘around view monitor’ (standard on all ST-X grades), second row ISOFix child seat mounting points (on all dual-cab grades), and the availability of a reverse camera on all pickup variants. 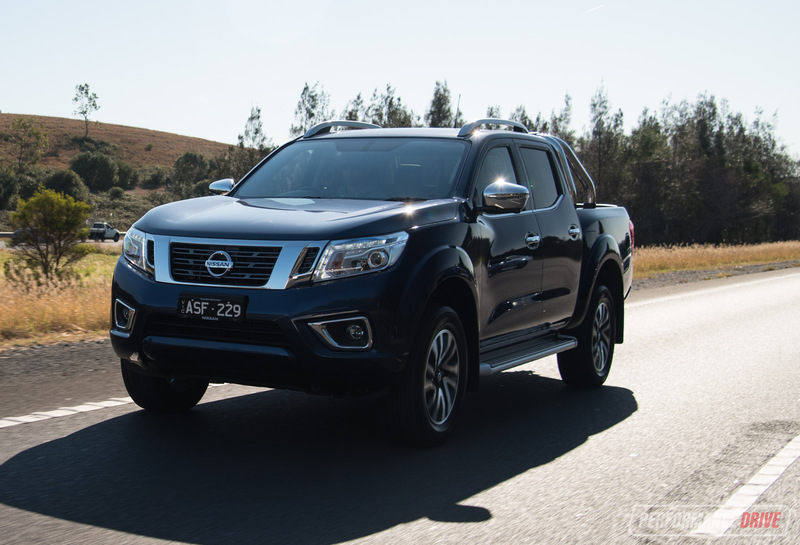 All Navara SL, ST and ST-X models built from June 2018 production will feature a digital speedometer housed within the instrument cluster as well. 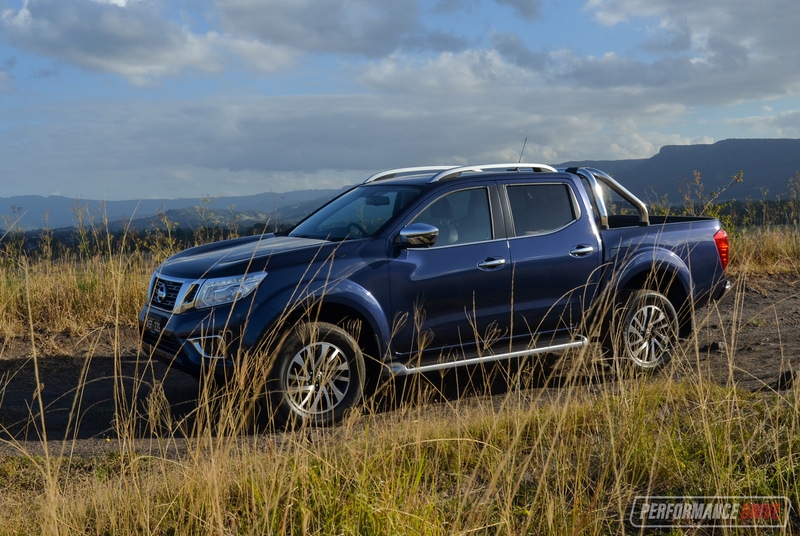 Whereas the Ford Ranger is arguably the meanest-looking model in the segment, the Navara is tough, yet smart in appearance. It’s a little softer around the edges. During our week with the car we received quite a few compliments, mostly along the lines of ‘hey, nice truck’. Part of the reason it looks so smart has to be down to the ST-X’s chrome details and neat set of 18-inch alloy wheels. 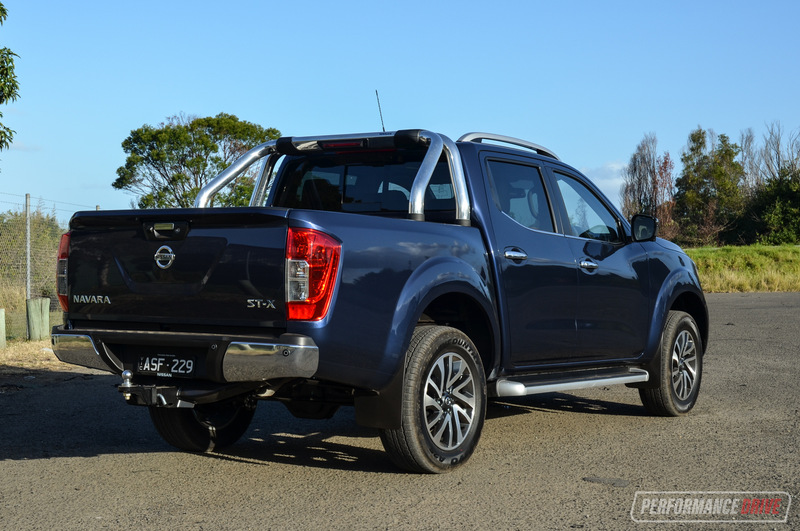 The biggest changes to the 2018 Nissan Navara aren’t visible from the outside – they’re hiding under the metal. The suspension and steering in particular have been improved to help with ride and handling. For the rear axle there’s now a dual-rate spring system that has an integrated lower and higher spring rate that provides a comfortable ride when the tray isn’t loaded or is only holding a light load. 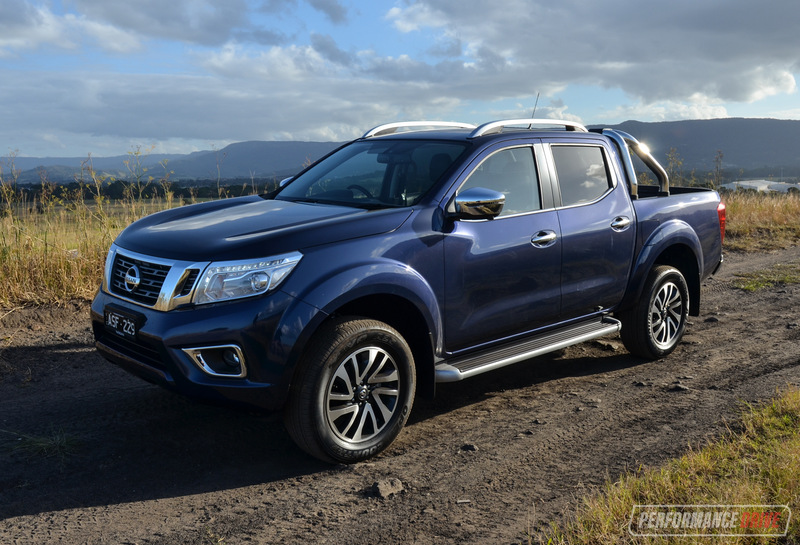 The reason for this is so that the Navara doesn’t feel light or bobble around when unladen. And it shows. Too many 4×4 utes are guilty of this, and the Navara isn’t one of them. There’s also a new dynamic rebound damper. When laden, the damper is designed to contact the chassis rail which causes the damper to compress and the resistance to increase. This then reduces lateral body movement and helps the Navara to feel more stable. 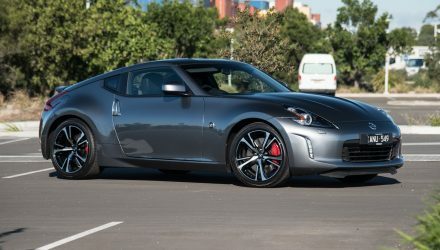 Nissan says in addition to the suspension change the linear steering ratio has increased. 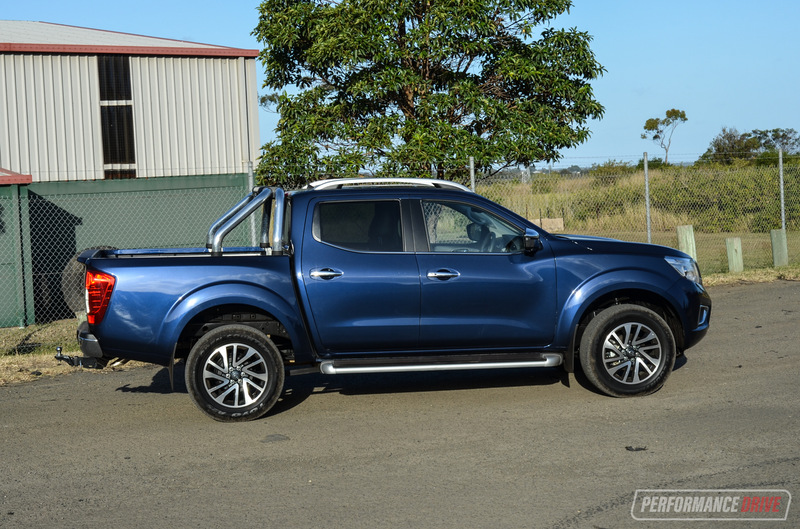 The steering ratio on the dual-cab SL, ST and ST-X has been improved from 21.5:1 to a lower 19.0:1. It’s now faster lock-to-lock, making it a much easier rig to pilot around town. One complaint we have about the steering is that the wheel itself is almost vertical in position. It’s particularly noticeable if you’re tall. This could be fixed if the Navara offered more than just telescopic steering column adjustment. 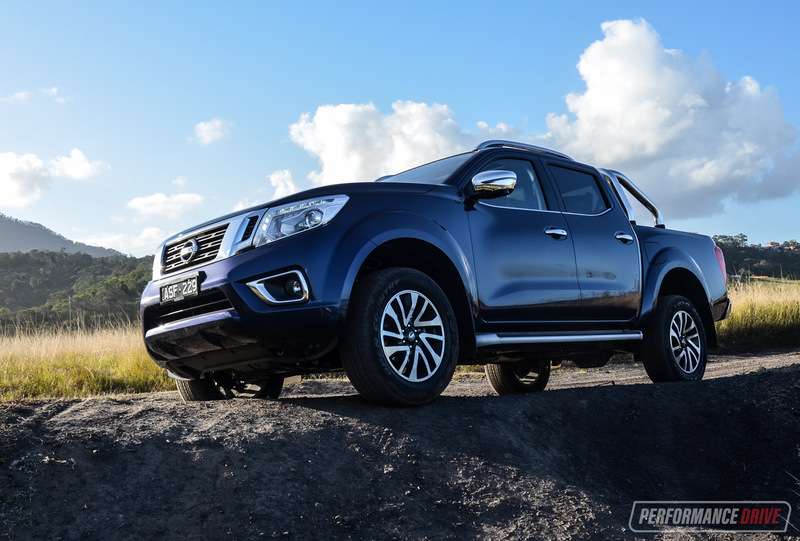 Out on the road the Navara brakes very well for a big unit, offering nice progressive pedal feel. It doesn’t’ dip or dive too much under brakes either, remaining compliant and stable. Even when pushed. 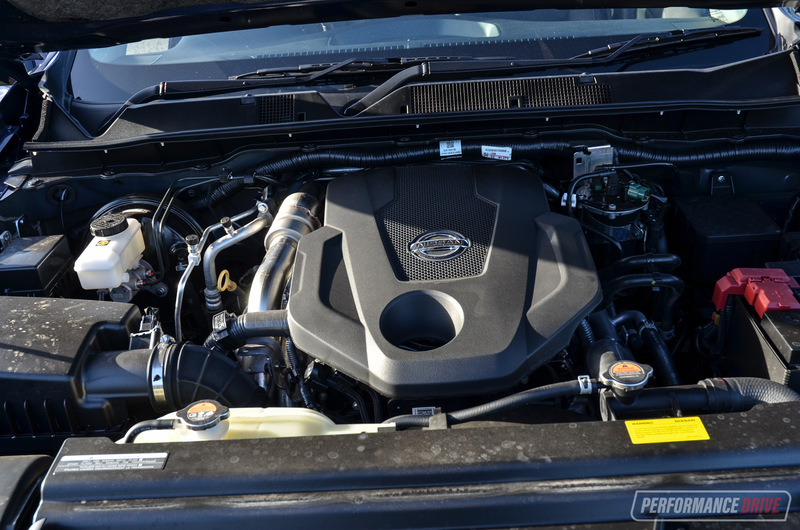 Up front, the 2.3-litre twin-turbo is one of the more refined engines in the class in our opinion. There’s minimal turbo-lag off the mark, with strong mid-range pull. Like with many other diesels though, particularly in this segment, top-end power does tapper off. Peak power is reached at just 3750rpm, which means you does need to rev it out to achieve decent acceleration. 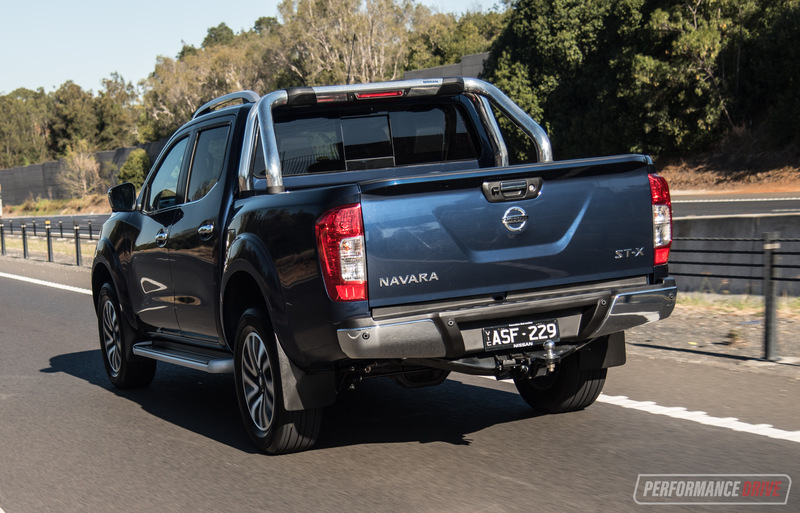 Although we didn’t time this specific vehicle, we recently tested the Navara ST dual-cab auto across 0-100km/h in it recorded an impressive 10.03 – it’s one of the quickest diesel utes we’ve tested. This ST-X weighs about 50kg more than the ST, with the added luxuries, but we’d expect a very similar time. It’s also quite economical for such a big thing, using just 8.6L/100km during our week-long test. Matched up to the seven-speed automatic, you’re rarely left in the wrong gear irrespective of what driving situation you’re in. 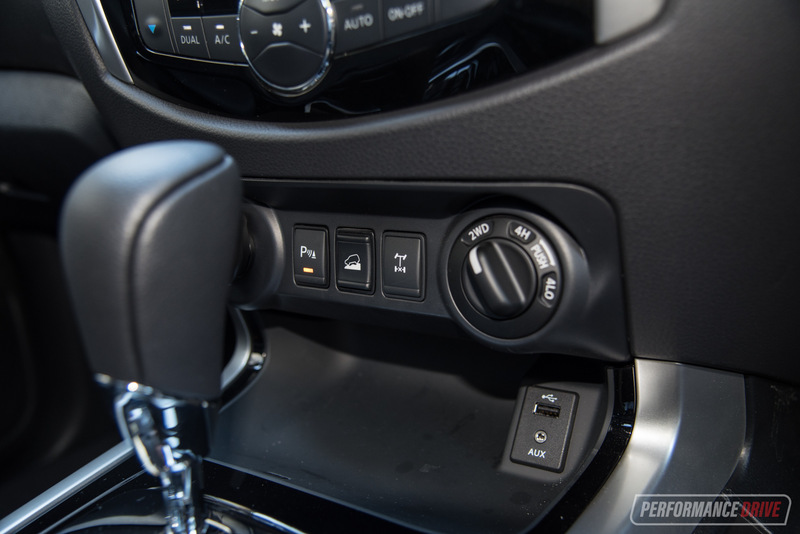 The nice thing about the automatic over the six-speed manual is that the auto’s brain is able to find and remain in the meaty torque wave – this makes day-to-day driving all the more relaxing. If you’re considering towing heavy things you‘ll be glad to know the ST-X 4×4’s maximum braked towing capacity is a class-equaling 3500kg. 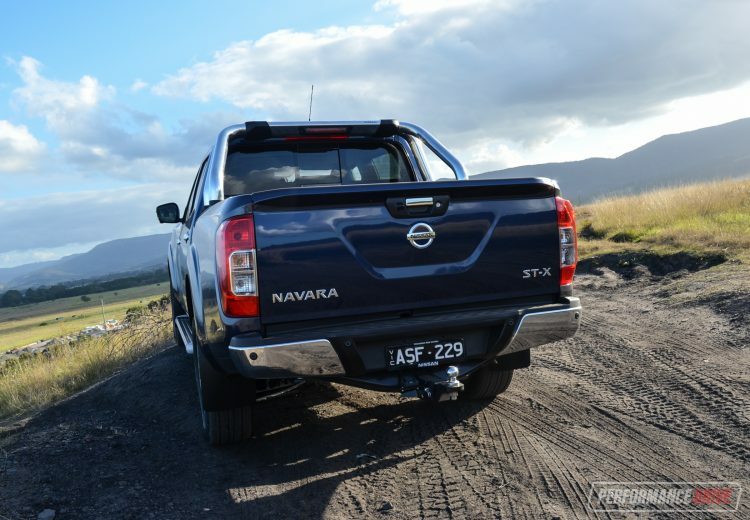 We can’t talk about the Navara and not mention how it performs off-road. We ran it through a variety of 4×4 scenarios, ranging from steep rocky hills to having to clamber through uneven rutty tracks. The suspension changes made to the 2018 model seem to help the Navara feel more agile off-road. It proved strong at everything we chucked at it. 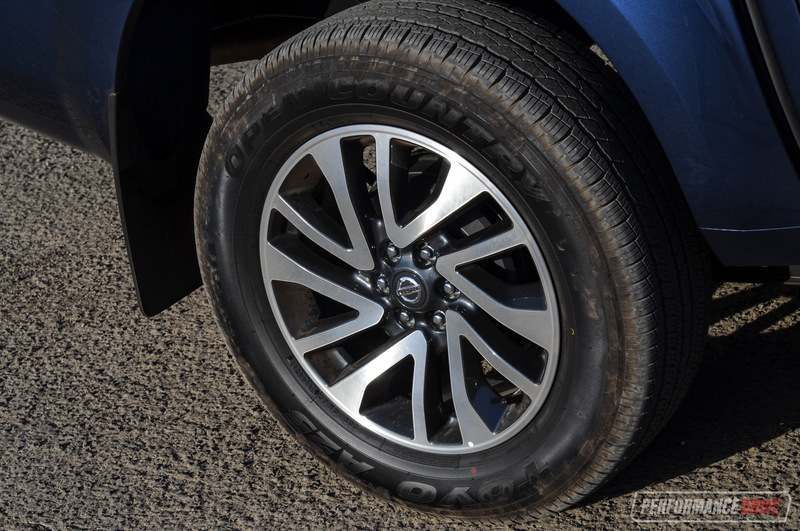 Even the factory tyres are up to the task of some light off-roading. 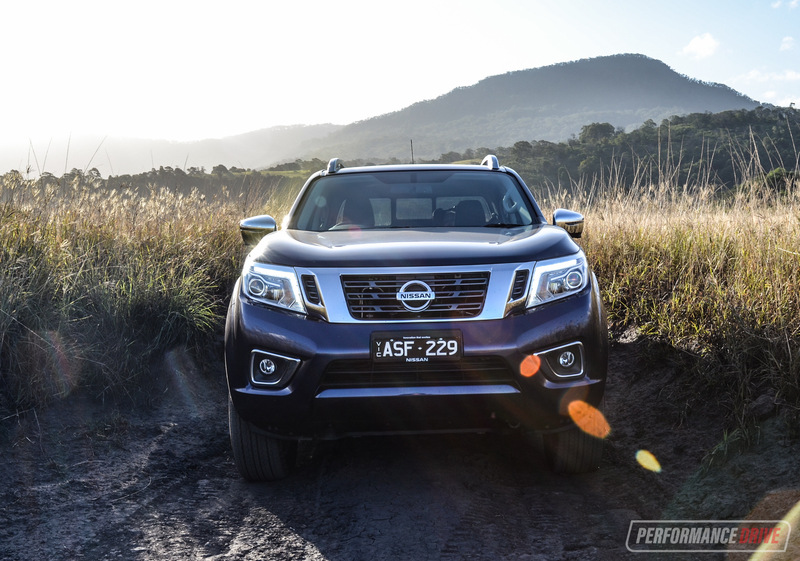 The main thing that stands out about the Navara off-road is how it makes light work of tough situations. 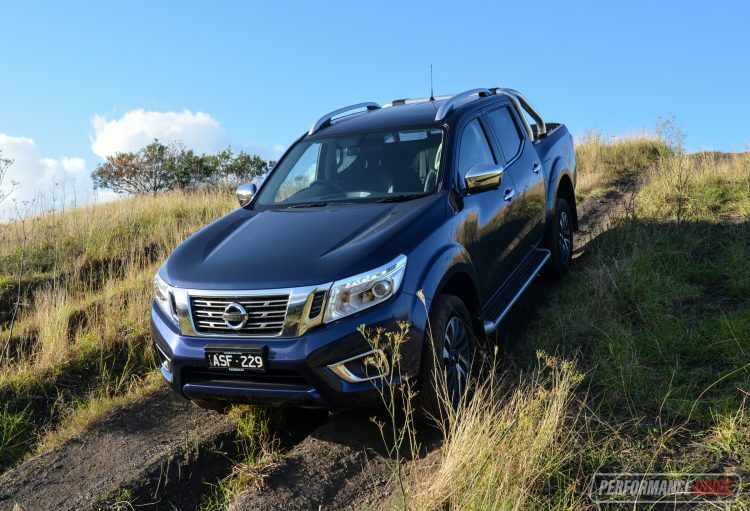 Other than low- and high-range 4×4 options, the Navara comes with features like hill descent control, which works excellently on steep hills, and a rear diff lock which is easy to engage and really helps the Navara claw through very tough conditions. 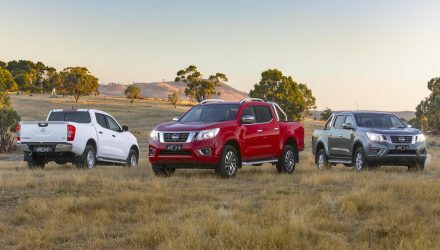 The 4×4 ute segment is arguably the most competitive of them all. If you combine the 4×2 and 4×4 sales for May (2018) only, you’re left with 18,387 sales. It’s the biggest market there is – not even the increasingly popular medium-size SUV class can top this (15,080 sales). 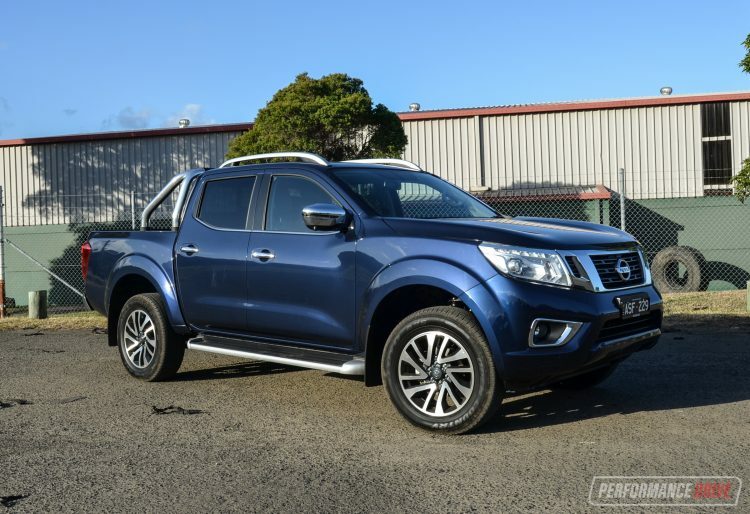 In a sea of choice, the Nissan Navara does everything required from it in a very fashionable manner. It drives really well around town. 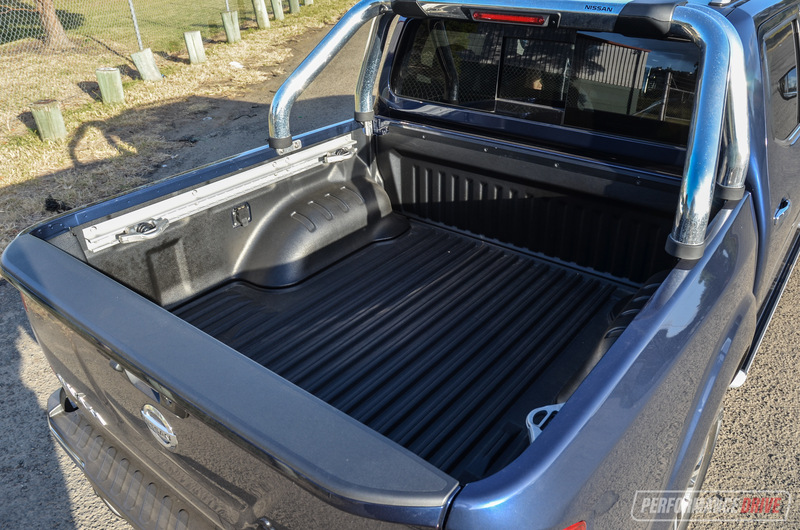 It’s very handy as a 4×4, and it’s comfortable and roomy enough to fit a family of five. 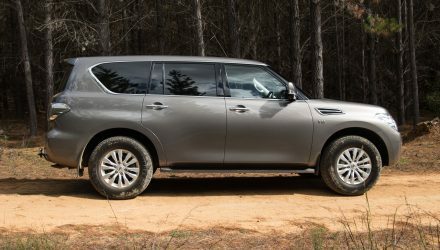 This is great option if you’re trying to combine the benefits of a 4×4 SUV with the ability to tow big loads. It’s also a very viable option if you’re looking for a worksite office on wheels.